We play Americana bluegrass cowboy folk honky-tonk jam mostly, but we don't like to label ourselves. THE MAGNIFICENT SEVEN. As my wife sometimes gleefully points out, I spent my early youth enchanted by the trappings of cowboy culture. Given the choice, I would almost invariably dress myself in a hat, boots (spurs, even! ), jeans and vest, with a toy gun-belt as embellishment. It's all terribly gender normative and regressive and what-have-you, but it's my childhood and anyway it's well behind us now. The more salient notion here is that, despite growing up out on the perimeter of this country, deep in one of the last vestiges of the Wild West, I am perhaps more a product of generations of Western movie fans than of the place where I was raised. The genre has broader, more pronounced cultural influence and implication than toddlers garbed to ride fences, of course. But my sense memory of that costume helps me access our 100 years of American Western cinema and its survey of popular artists commenting both on history and the events of the day. Maybe more immediately, we can access (and, with a little more effort, contextualize) the entertainment of previous generations: My grandparents may very well have seen Stagecoach (1939) on the big screen; they likely took my parents to see The Magnificent Seven (1960) when it hit theaters. Westerns are not for all tastes, but they are emblematic and omnipresent in our culture. They, like a fair number of other art forms, could be said to have evolved and improved on other shores, but they are as distinctly American as jazz, for better or worse. They speak a visual language we all understand, even if we don't acknowledge it. I won't belabor this much further or offer a point-by-point comparison of the new Magnificent Seven and the old. But context is important. Quentin Tarantino's decision to break open Westerns and recast them in his own image is an intimidating act to follow. Django Unchained (2012) and The Hateful Eight (2015) are, of course, crazy, cross-genre syntheses; it's Tarantino. But they are also canonical Westerns by virtue of that same craziness: They are true to an almost innumerable array of visual and narrative tenets of the genre but they use those motifs to tell new stories and to comment on contemporary culture. They have something distinct and important to say but they say it in the language of entertainment. 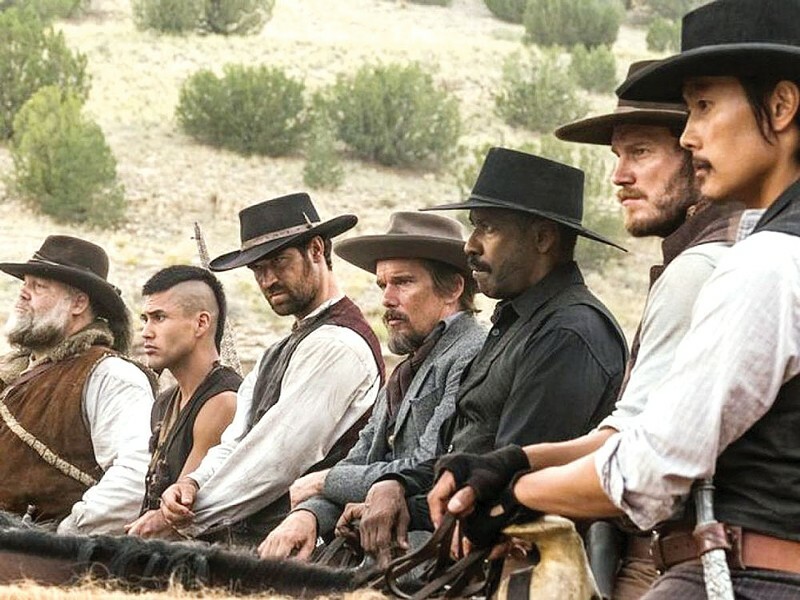 While director Antoine Fuqua's (Training Day, Southpaw) version of The Magnificent Seven is certainly not without its attributes, it is difficult to remove from the shadow of Tarantino's recent work, not only for the genre connection but for Furqua's more timorous approach to race and violence. The settlement of Rose Creek, somewhere in California, sometime after the Civil War, is subject to the whims of demonic robber baron Bartholomew Bogue (Peter Sarsgaard). He requires the acquiescence of the town's people to enlarge his gold mine, and little will slow him in his expansion, as evinced in the opening, which pointedly includes the summary burning of the church and murder of several townspeople. Soon after, we meet Sam Chisholm (Denzel Washington), a duly appointed officer of the court (read: bounty hunter), plying his trade. He is approached by the widow (Haley Bennett) of one of the aforementioned murder victims to assemble a team of killers and defend Rose Creek against Bogue's private army. Chisholm agrees, for reasons that will only become clear much later, and sets out to do some recruiting. He picks up wisecracking souse and gunslinger Joshua Farrady (Chris Pratt) almost by accident. Next up is Vasquez (Manuel Garcia-Rulfo), who doesn't have much of identity beyond being Mexican. Then comes Goodnight Robicheaux (Ethan Hawke), a former Confederate sharpshooter with PTSD who is accompanied by the many-knife wielding Billy Rocks (Byung-Hun Lee). Jack Horne (Vincent D'Onofrio), a scripture reciting beast rumored to have murdered more than 300 Crow when the government was trading in scalps, and Red Harvest (Martin Sensmeier), a wandering Comanche with little reason to join this troupe, round things out. Now seven, this pack of strays make their way to Rose Creek, where they begin to train the willing but largely incapable townspeople in the art of war. This leads to the inevitable climactic battle, in which they face off against Bogue and his hundreds (literally hundreds) of hired guns. Fuqua knows how to direct an action sequence as well as anyone and his strengths are proudly displayed here. Each frame is packed with admirable period detail, from costumes to sets to weaponry. And the cast gives life to the characters well beyond what I suspect was found on the page. Sarsgaard's Bogue moves with serpentine menace giving way to mania; Hawke finds the traumatized center of Robicheaux, his bravado giving way to doubt and horror; D'Onofrio makes himself almost unrecognizable, doing an alternately lyrical and barbaric little ballet onscreen. It's almost enough to elevate the movie as a whole, but not quite. Between shootouts, the scenes drag on needlessly; the adherence to genre tropes gets to be too much; the big reveal of Chisholm's true motives, right at the end, feels too on-the-nose, too precipitously delivered, to have much impact. There is plenty to like and admire in The Magnificent Seven, maybe more than I expected. It's true to its long and storied genre lineage but it doesn't add anything new. PG13. 133m. BROADWAY, FORTUNA, MILL CREEK. DEEPWATER HORIZON. Mark Wahlberg stars in this offshore drilling disaster movie. PG13. 107m. BROADWAY, FORTUNA, MILL CREEK. MASTERMINDS. Zach Galifinakis stars as a patsy on the lam in a comic armored car heist movie with Kristin Wiig and Owen Wilson. PG13. 94m. BROADWAY, FORTUNA, MILL CREEK. MISS PEREGRINE'S HOME FOR PECULIAR CHILDREN. Eva Green stars as headmistress in Tim Burton's adaptation of the book about children with magical powers. PG13. 127m. BROADWAY, FORTUNA, MILL CREEK. QUEEN OF KATWE. True tale of a Ugandan girl who rises through the ranks as a chess champion. With David Oyelowo, Lupita Nyong'o and Medina Nalwanga. PG. 124m. BROADWAY. SOUTHSIDE WITH YOU. Heal your Brangelina pain with a dramatization of young Barack Obama's game on a first-date stroll through Chicago with Michelle. PG13. 84m. MINOR. BLAIR WITCH. With a plot as shaky as the footage, this sequel isn't reason enough to go back into the woods. R. 89m. BROADWAY. BRIDGET JONES'S BABY. Renee Zellweger returns as the heroine, this time pregnant and unsure whether the father is her Yank fling (Patrick Dempsey) or her ex (Colin Firth). Insert Cathy "arrgh!" R. 123m. BROADWAY, MILL CREEK. CAPTAIN FANTASTIC. Viggo Mortensen stars in this compelling story of grief and wonder about an off-the-grid family venturing into civilization for their mother's funeral. R. 118m. MINOR. HELL OR HIGH WATER. A pair of bank-robbing brothers (Chris Pine, Ben Foster) are pursued by a pair of Texas Rangers (Jeff Bridges, Gil Birmingham) in a fine, character-driven film about what poverty does to people. R. 102m. BROADWAY. SNOWDEN. Oliver Stone defies recent expectations for a compelling look at modern society, patriotism, warfare, politics and freedom. With the versatile Joseph Gordon-Levitt. R. 106m. BROADWAY, MILL CREEK, MINOR. STORKS. A retail delivery bird winds up in the baby business trying to get an infant to a family. Or you could just have the talk with your kids. Voices of Jennifer Anniston and Kelsey Grammer. PG. 87m. BROADWAY, FORTUNA, MILL CREEK. SUICIDE SQUAD. This mess of semi-random violence rattles on pointlessly as DC villains take on badder guys. PG13. 123m. BROADWAY. SULLY. Director Clint Eastwood resists the soapbox for a compact, patiently told real-life story of heroism with a masterful performance from Tom Hanks. R. 106m. BROADWAY, FORTUNA, MILL CREEK.